Hello, friends! Back with another challenge card for you! The WTUI Challenge on Splitcoaststampers was to use stripes so I planned a patriotic card in honor of our nation's upcoming birthday. 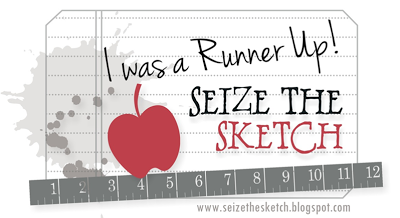 The challenge also included the use of a silhouette image which threw a monkey wrench into my plan! 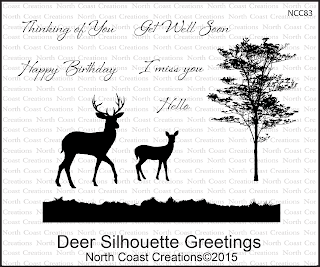 Fortunately I had just received the Deer Silhouette Greetings stamp set by North Coast Creations, a sister company of Our Daily Bread Designs. I love this set! 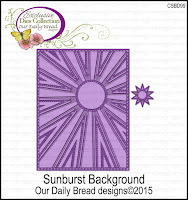 Creative Nugget: The white background panel was embossed with the Sunburst Background Die. 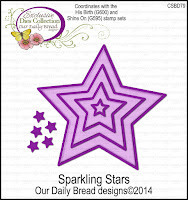 A Sparkling Star Die was used to cut a star from a piece of paper from the Patriotic Collection by Our Daily Bread Designs. This panel was stitched to a piece of blue card stock. Two of the Sparkling Star Dies were used to create a red frame for the star cut out, and another star cut from coordinating striped paper was embedded into the cut out. 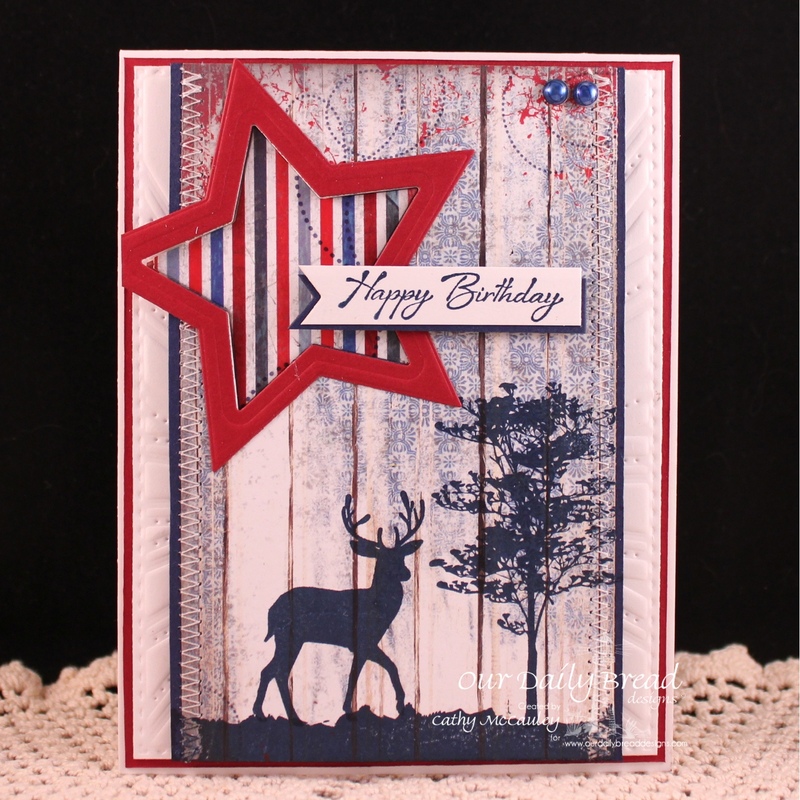 The deer silhouette scene was stamped in blue ink and the sentiment was cut from one of the Pennant Dies. 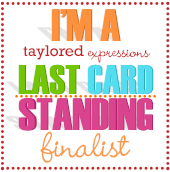 Several pearls were added to finish the card. 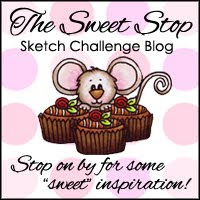 This week's sketch from Freshly Made Sketches was used for the design of the card. Hello, dear friends and Happy Father's Day to all you dads out there! 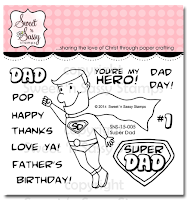 I have a Father's Day card to share with you today. My dad passed away almost twenty years ago. He loved the ocean, especially deep sea fishing, so The Sea clear stamp set by Sweet 'n Sassy Stamps, now back in stock, was the perfect choice for a card in memory of my DAD! 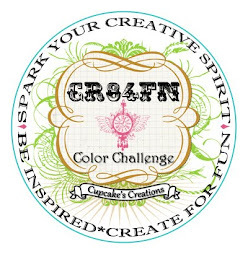 Creative Nugget: Graphics 45 papers helped set the stage for the sailing vessel image from The Sea which was colored with Prismacolor Pencils and Gamsol. 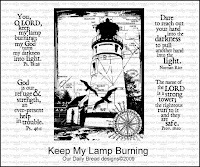 The split sentiment is from the Camping Fun stamp set and was cut with the Banner Dies. 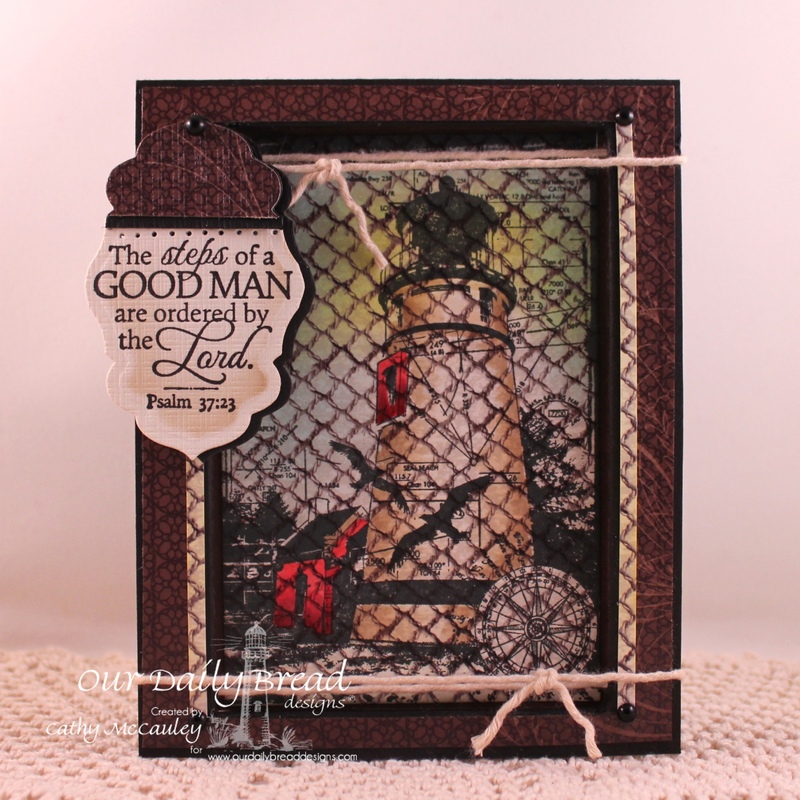 A sailor's knot made with rope twine and a few black pearls were added to finish the card. Trips to the ocean always bring back fond memories of my dad! Even though my dad is no longer here, I have a heavenly Father who loves me even more than my earthly father did…and so do you! 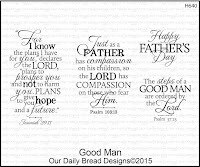 Have a wonderful Father's Day!! Hello friends! 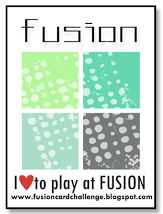 Our church had Vacation Bible School this week so it has been a little crazy…and busy! Many of our activities for the week were scheduled for outside and of course the meteorologists were calling for rain and thunderstorms each evening. Amazingly, the rain held off just long enough each night for us to complete our activities, and the kids have been having a lot of fun! The rain that we did get was a blessing and gardeners were thrilled that their flowers and plants received the much needed nourishment. 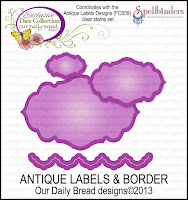 My homegrown card for today is actually a CASE of THIS card by my Breadstick sister, Paula Bigelow. 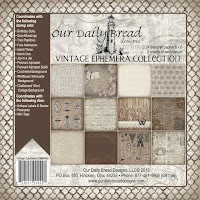 Creative Nugget: All stamps and dies used on this card are from Our Daily Bread Designs. 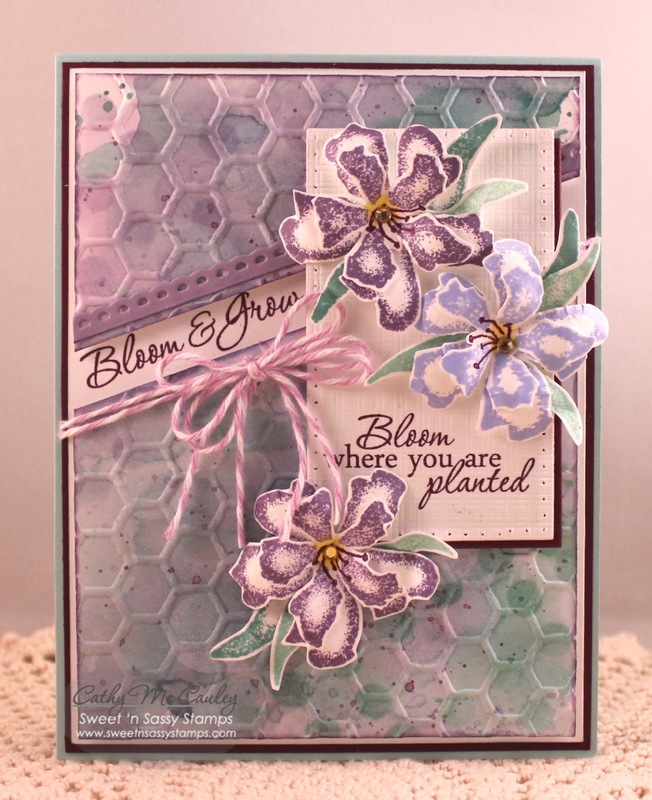 Paper from the Blooming Garden Collection was cut with the large rectangle from the Flourished Star Pattern die set and along with Summer Sun card stock was added to the card base. 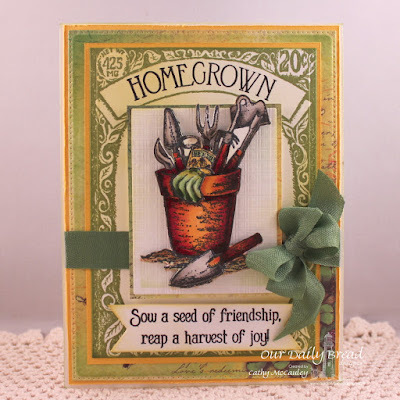 The Seed Packet was stamped in Fern Green Archival ink and the homegrown sentiment added. The image from The Good Seed was stamped three times and colored with Copic Markers. 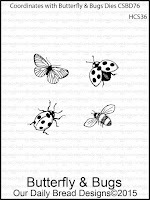 Portions of the image were fussy cut and popped up for dimension. The sentiment was stamped and cut with one of the Pennant Dies and a seam binding bow added to finish the card. My prayer is that some of the rain we've been getting in the east makes its way out west to my friends in California! 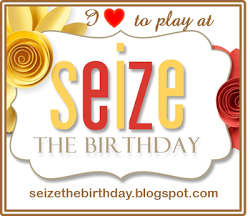 Thanks so much for stopping by…sow a seed of friendship today! Creative Nugget: The background for this card was made by laying down Evergreen Bough, Shaded Lilac, and Dusty Concord distress inks on a craft mat then spritzing the inks with a generous amount of water. A piece of Mixed Media paper was smooshed onto the inks and dried with a heat tool. 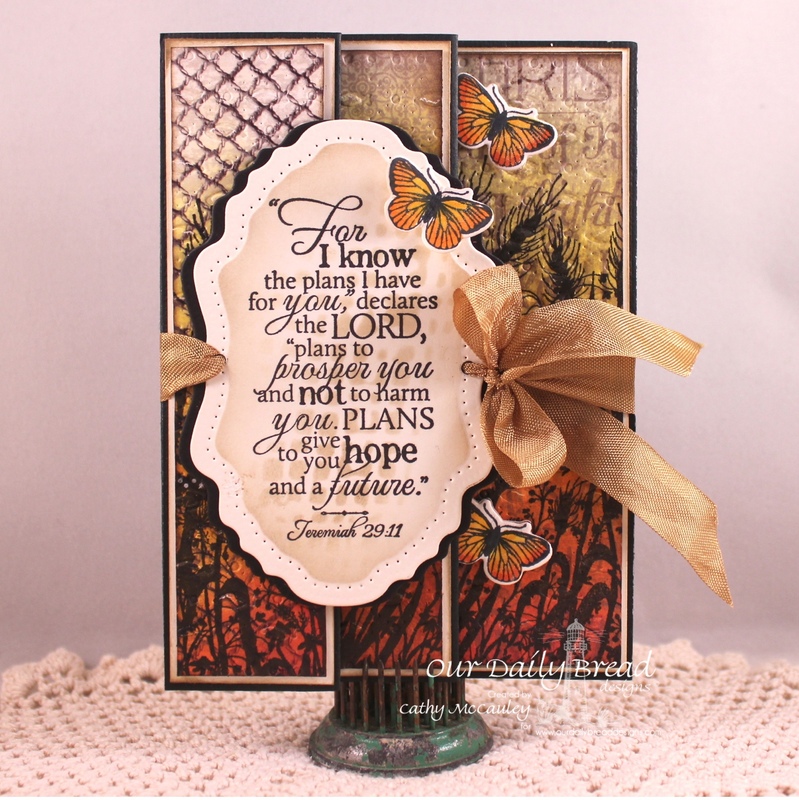 This panel was then embossed with a honeycomb pattern, split and popped onto the card base. One of the sentiments from the Bloom & Grow stamp set was stamped between the diagonal split. 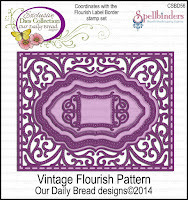 The flowers were also stamped using the same distress inks. Each flower was fussy cut, sculpted using a stylus, and layered onto the top panel. 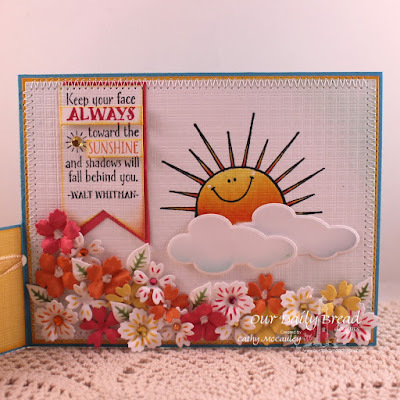 A second sentiment from the set was stamped between the flowers. Gem stones were used in the middle of each flower and Baker's Twine was added to finish the card. 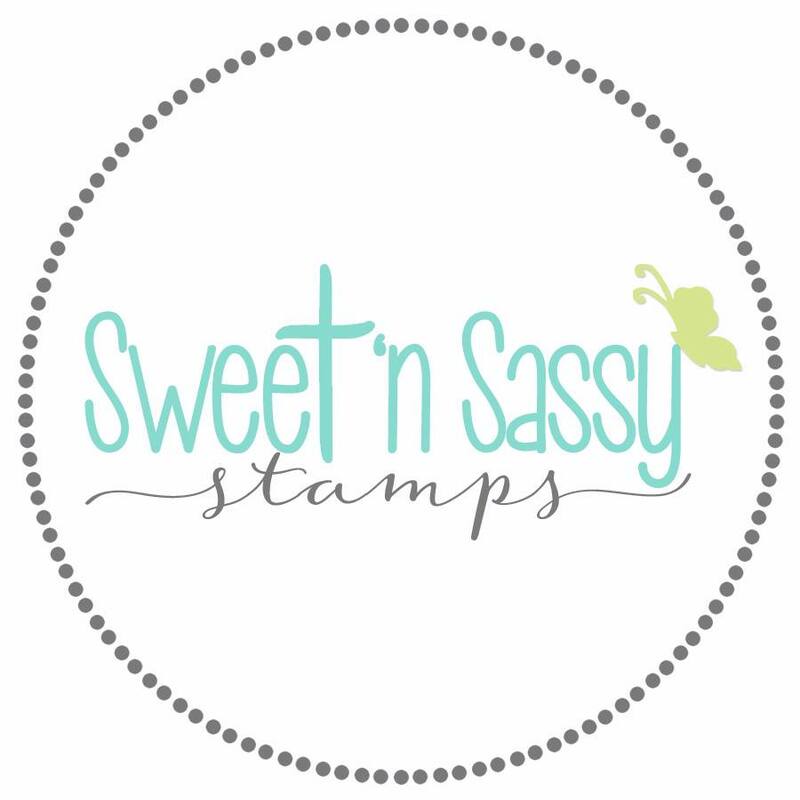 Be sure to check out the details on the Sweet 'n Sassy Stamps Blog and see more beautiful samples made with this pretty floral stamp set. 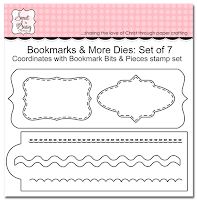 The border on the sample above was made with one of the Bookmarks & More Dies. Thanks so much for stopping by! Take time to stop and smell the flowers! Welcome, my friends! 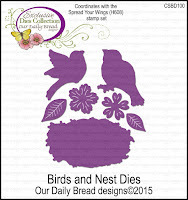 Today we are taking a look back at Our Daily Bread Designs June 2015 Release. Get ready to be inspired by our sunny creations and masculine cards perfect for the special man in your life made with the stamps and dies released earlier this month. Creative Nugget: A friend of mine gave me this verse over fifteen years ago while I was battling cancer…it has become my life verse and one of my very favorite verses in the Bible. 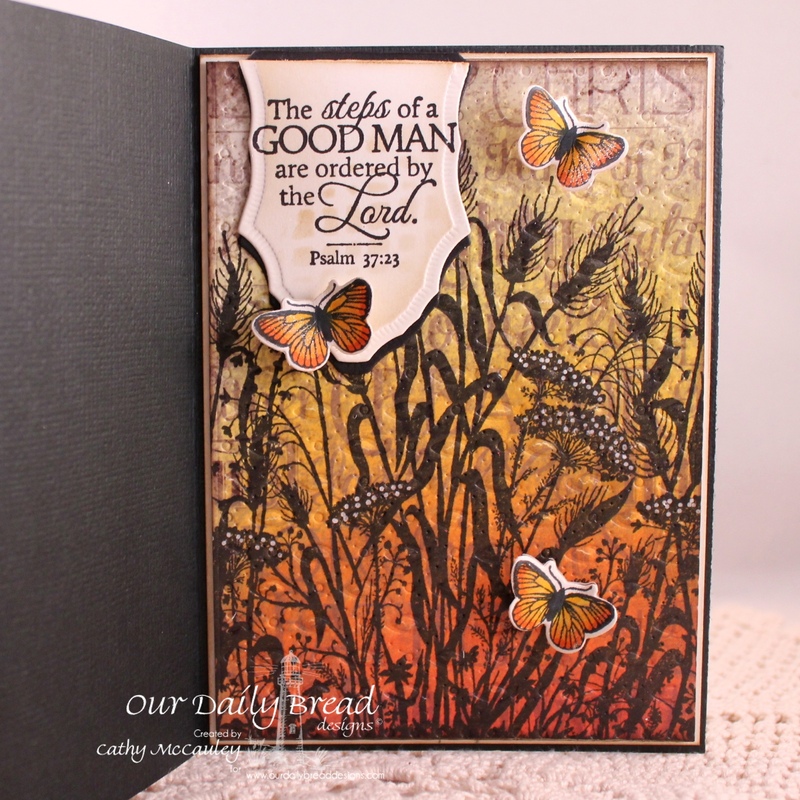 The Jeremiah verse from the Good Man stamp set became the focal point for this accordion card and was cut and matted using the Vintage Flourish Pattern Dies. Three different patterns from the beautiful Vintage Ephemera Paper Collection were mounted on three sections of the accordion fold. 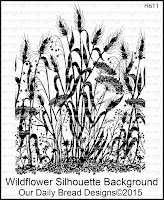 Since one of the papers from the collection is printed with the Wildflower Silhouette Background, the stamp was used on each panel. Color was sponged on each panel to look like a sunrise. 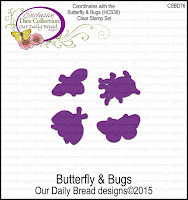 The butterfly from Butterfly & Bugs was stamped several times, colored, and cut with the matching Butterfly & Bugs Die. The card is tied closed with a piece of seam binding. …and a better look at the opened accordion fold. 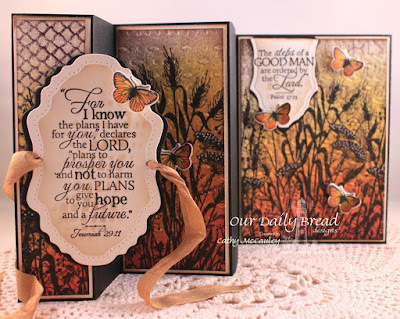 To see more wonderful card samples made with the June Release, head on over to the Our Daily Bread Designs Blog. 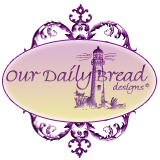 Be sure to visit each blog of the talented Bread Sticks to see a close up of their projects along with the details! 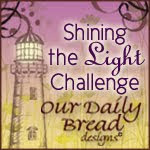 I hope you were inspired by your visit…have a wonderful day! Hello friends! It's a little cloudy and rainy here, so I thought I would brighten your day with a little sunshine! I actually have two sunny cards to share with you made with some fabulous new products released at the beginning of the month from Our Daily Bread Designs. Both cards are made with the happy, new Sunshine Blessings stamp set! 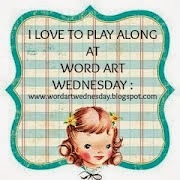 Creative Nugget: Doesn't this just make you smile! The happy sun from the Sunshine Blessings stamp set was stamped at the bottom of the tilted panel, colored with Copic Markers, and framed with Daffodil Delight card stock. A few sunny splatters and sequins were added before mounting the whole panel to a piece of Neenah Solar Crest card stock embossed and lightly sponged with the Sunburst Background Die. 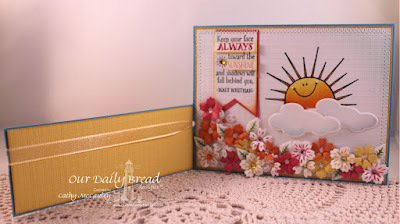 The little sunshine banner was hand cut from one of the larger sentiments in the set and the little "hello" from the Mini Tag Sentiments stamp set was stamped above the banner. 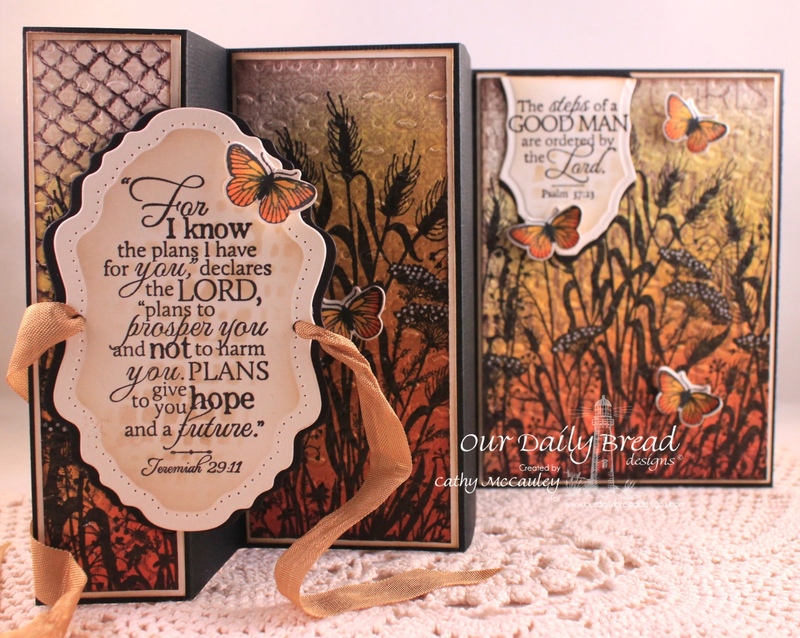 Creative Nugget: Both panels were embossed, watercolored, and sponged with the Sunburst Background Die. 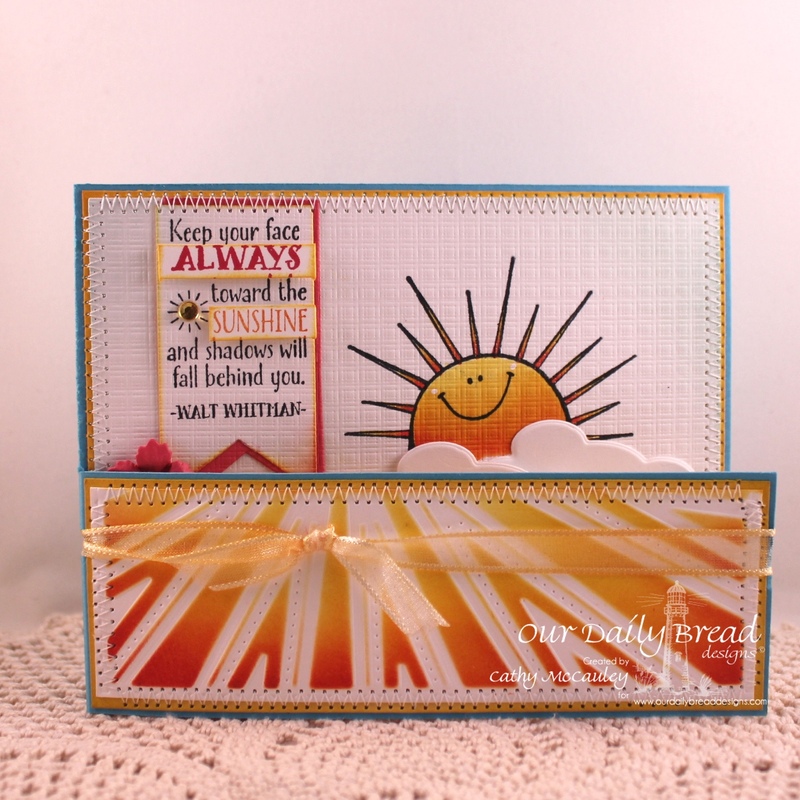 The smile from Sunshine Blessings was stamped inside the embossed sun on the top panel and cut with a circle nestie creating a frame for the shaker. The smile was then mounted to the bottom panel to show through the opening. "Hello" was also die cut from the top panel. Acetate was adhered to the back of the top panel. Seed beads were colored with Copic refill ink to be placed inside the shaker. The top panel was popped up with foam tape. 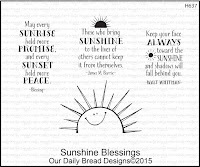 The sunshine banner was again hand cut from a larger sentiment in the Sunshine Blessings stamp set. A bow made with sheer ribbon and a few sparely rhinestones and sequins were added to finish the card. Thanks so much for stopping by! Send someone a little sunshine today! Creative Nugget: My father has been gone for twenty-one years now and I still can't go to the beach without thinking of him. 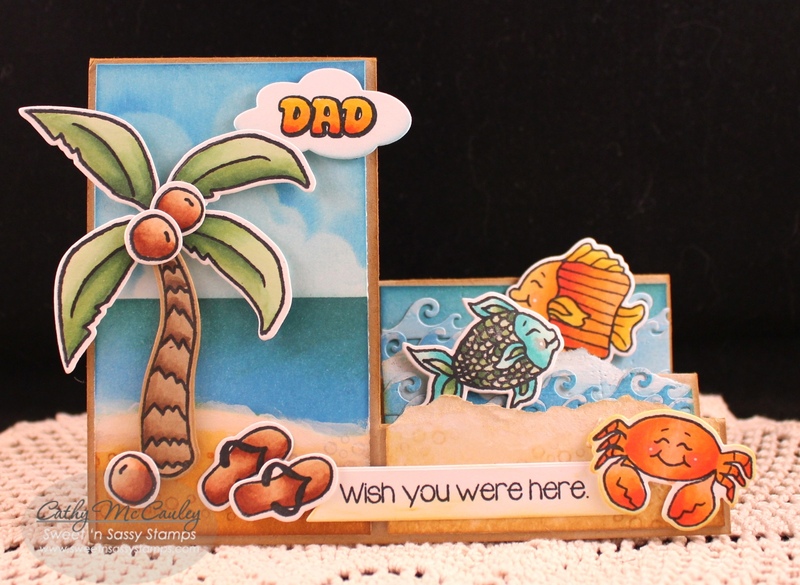 He loved the ocean, loved catching and eating crabs, and LOVED deep sea fishing…so this one is in memory of my dad! I enjoy creating scenes on cards so the Wish You Were Here and Happy Ocean Friends stamp sets were perfect for making my beach side-step card. The background for the card was sponged and the elements of the scene were colored with Copic Markers. 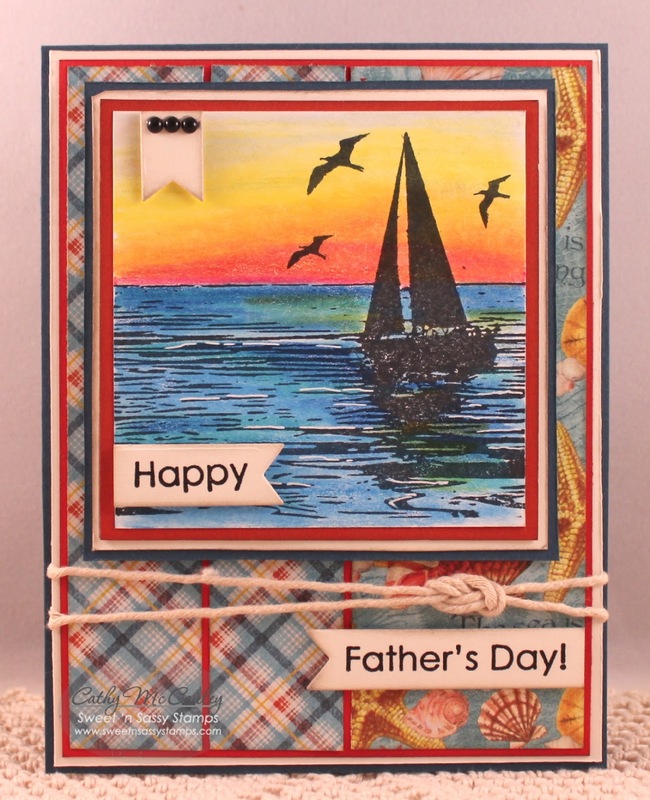 The "DAD" sentiment is from the Super Dad stamp set and the Beach Dies, the Clouds & Raindrops Dies, and the Banner Dies were also used to complete this card. Thanks so much for stopping by…have fun hopping along for the Let's Hear It For The Boys Blog Hop! Hello friends! 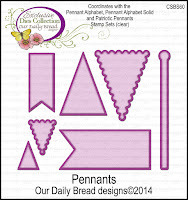 I have a quick card to share today that was so much fun to make! 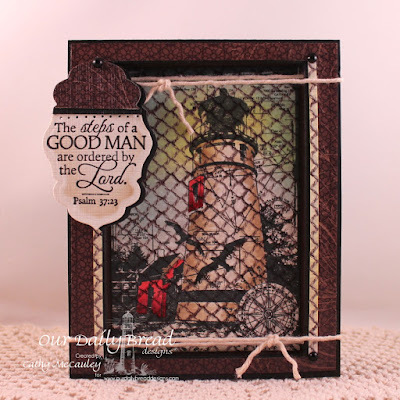 I've been wanting to try THIS card fold that I found on Pinterest and was inspired by THIS card created by Sunday's Featured Stamper on Splitcoaststampers, Lizzie Walker, and by THIS card made by Judy Rozema using the Sweet 'n Sassy Stamps set, Happy Home. Creative Nugget: I modified the directions to form the base for my standing box card and lined each panel with patterned paper to form the background for this little neighborhood scene. A fence and some rolling hills were added. Then it was just a matter of coloring the little houses and trees with Copics, fussy cutting them out, and attaching them with foam tape to vary the dimension for each layer. 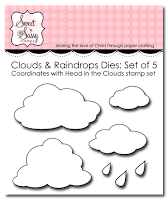 Finally some clouds were die cut, one of which was used for the sentiment. What a colorful, happy neighborhood! Wouldn't you just love to live here? Thanks so much for stopping by…find time to spread some kindness to a neighbor today!